Standard zipper front Tyvek coverall with attached hood, non-skid booties and elastic at the wrist. Total body coverage except the face. Wear a respirator and protective gloves and you're pretty well covered. Used extensively in asbestos and lead abatement. We sell these individually and the price is for 1 suit. Order any quantity. Standard zipper front Tyvek coverall with attached hood, non-skid booties and elastic at the wrist. Total body coverage except the face. Wear a respirator and protective gloves and you're pretty well covered. Used extensively in asbestos and lead abatement. We sell these individually, and the price is for 1 suit. Order any quantity. Longer zipper extends to chin for complete coverage of neck area Elastic opening for tighter fit at wrist Attached respirator-fit hood with elastic around face opening, designed to cover neck and chin and fit around respirator face mask Comfort fit design based on extensive wearer input to provide our most comfortable garment design that: enables a greater range of movement while stretching and bending, provides a more tailored fit, offers reinforcement in high stress areas for fewer blowouts, utilizes a longer zipper for easier donning and doffing and an elastic waist to better position the garment. Serged seams, attached hood, front zipper closure, elastic wrists, and attached boots. Inherent barrier protection against dry particulate hazards. Applications range from agriculture to spray painting to lead remediation, hurricane clean up to fall clean up. Even after abrasions, stops microporous particles better than other reusable garments. 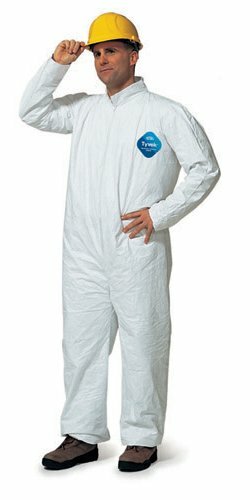 Tyvek coverall suit is a breathable yet water-resistant non-woven fabric made of heat and pressure bonded olefin fiber. Resists tears and abrasions and provides a barrier to particles down to one micron in size. It is more durable than microporous film fabrics due to protection being part of the fabric rather than an added layer. Attached is the hood with elastic face opening to cover head, neck, and chin, and to fit around a respirator face mask. The boot is made of a non-woven fabric with a skid resistant friction coating help to reduce accidental slips. Elastic waist offers better comfort and to position the garment. This product features longer zipper for easier donning and doffing: extends to chin for complete coverage of the neck area. It also provides greater range of movement while stretching and bending. WARNING: This product can expose you to chemicals which is [are] known to the State of California to cause cancer and birth defects or other reproductive harm. For more information go to www.P65Warnings.ca.gov. 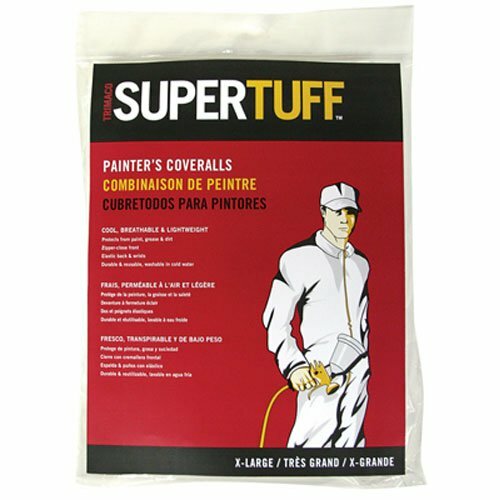 DuPont Coverall Suit offers superior protection in multiple applications. Elastic Wrists, Ankles and Hood keep tight seal from pesticides or paint. Serged seams, attached hood, front zipper closure. Inexpensive protection you can count on. Standard zipper front Tyvek coverall with attached hood, non-skid booties and elastic at the wrist. Total body coverage except the face.Wear a respirator and protective gloves and you're pretty well covered. Used extensively in asbestos and lead abatement. We sell these individually, and the price is for 1 suit. Order any quantity. The best balance of protection, durability and comfort. 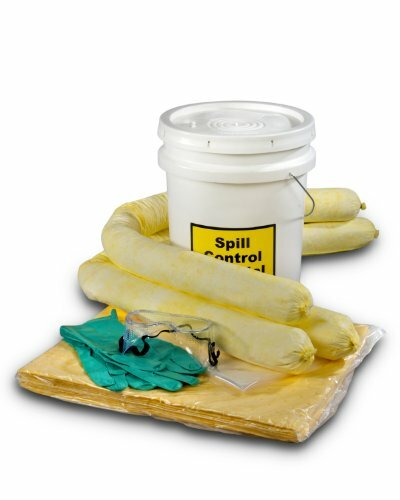 ESP hazmat absorbent spill kit contains 10 pads, 3 - 3"x 4' socks, 1 pair of gloves, 1 pair of goggles and 1 temporary disposal bag. 5 gallons oil absorbency. 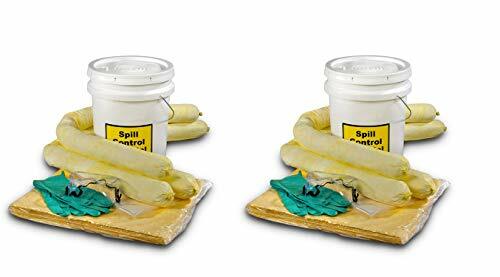 These compact spill kits are a great way to be prepared for minor spills, or to add extra support for larger ones. The bucket container protects items, keeping them clean, dry and ready when needed. Gloves help to ensure safe handling. Disposable bag holds used sorbents. Perforated pads make clean-up quick and easy. Used sorbents can be placed in the container for disposal. Fire retardant as per ASTM 726. Ensure that disposal of these sorbents complies with all local, state and federal regulations. Introducing Tyvek with the new comfort fit design. Professionals told us what they want in a protective garment. And they all agree, garments should fit better and not limit job performance. Thats why DuPont developed its Tyvek garment with the new comfort fit design. Moonsuit Nylon/Cotton Coveralls are lightweight and durable with a rip-stop nylon front. 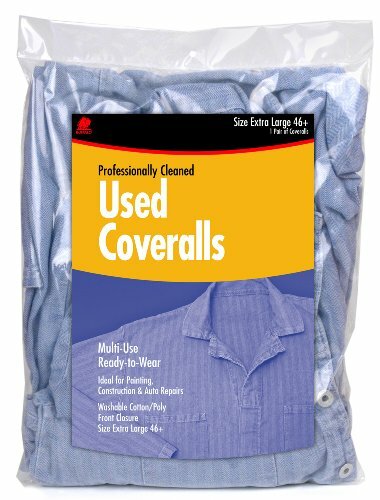 Breathable and comfortable for wear, these coveralls include a cool cotton back making these coveralls washable and reusable. Includes a full pull over hood, hook-and-loop wrists and ankle closures, zipper front and elastic waist. For over 30 years, SAS Safety Corporation has provided safety products and equipment designed to make workplaces safer. We are dedicated to providing quality products that protect and preserve our most valuable resource: people. We offer a complete line of personal protective equipment; eye and face, hand, body, respiratory and hearing protection, as well as first-aid kits, ergonomic, spill control, and traffic safety products. For over 30 years, SAS Safety Corporation has provided safety products and equipment designed to make workplaces safer. We are dedicated to providing quality products that protect and preserve our most valuable resource: people. We offer a complete line of personal protective equipment; eye and face, hand, body, respiratory and hearing protection, as well as first-aid kits, ergonomic, spill control, and traffic safety products. 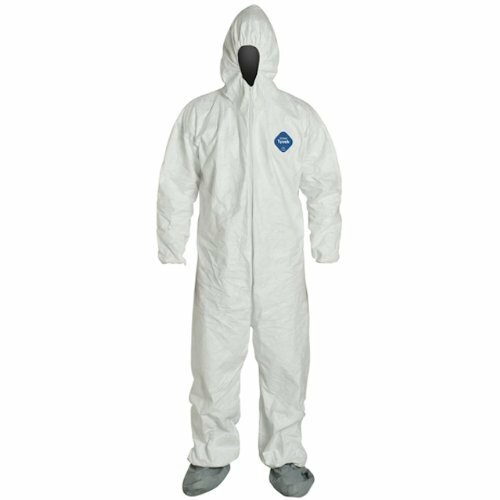 Brand: SAS Safety | Manufacturer: SAS Safety Corp.
Trimaco's SuperTuff Polypropylene Disposable Coveralls are made from a special non-woven polypropylene fabric that protects skin and clothing from paint, grease, overspray and dirt. These coveralls are tough, durable, lightweight, tear-resistant, washable and resuable! Features a zippered front and elastic back and wrists. Legs can be cut to fit any height. 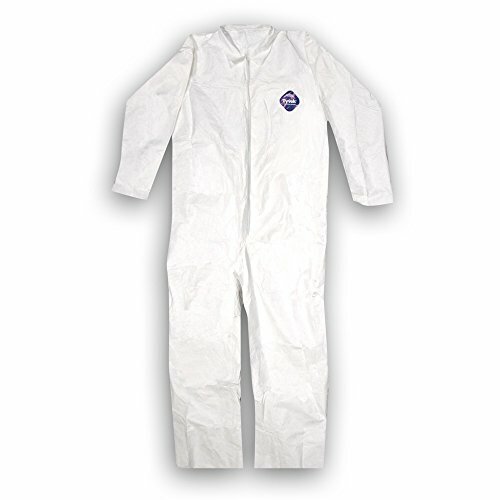 Standard zipper front Tyvek coverall with collar. Sizing meets or exceeds ANSI standards. We sell these individually, and the price is for 1 suit. Order any quantity. Serged seams, collar, front zipper closure. Applications range from agriculture to spray painting to lead remediation. Rain guard is North America s leading anti-graffiti coating manufacturer and has designed VandlTop as a one-time use, sacrificial product formulated to allow removal of graffiti defacement without the use of chemicals. VandlTop protects the environment and sensitive building surfaces which could be damaged with traditional graffiti removal products. Low pressure hot water graffiti removal No chemicals required. 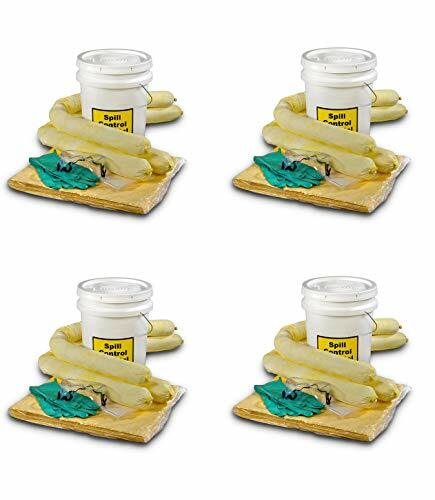 Use in environmentally sensitive applications or where chemicals could damage a substrate. Clear, matte sheen, non-yellowing formula with minimal change in the look of a building. Versatile protection on concrete, stucco, EIFS, brick, wood, metal, plastic & painted surfaces. Easy application Spray, brush, roll. Low cost application Single component, no mixing, no POT life issues, no expensive blasting required. Low Carbon Footprint Low VOC, low odor, water based, non-toxic, no cancer causing formula. Lower labor cost- Apply second coat after only 1-2 hours of dry time. Rain guard is North America s leading anti-graffiti coating manufacturer and has designed VandlTop as a one-time use, sacrificial product formulated to allow removal of graffiti defacement without the use of chemicals. VandlTop protects the environment and sensitive building surfaces which could be damaged with traditional graffiti removal products. 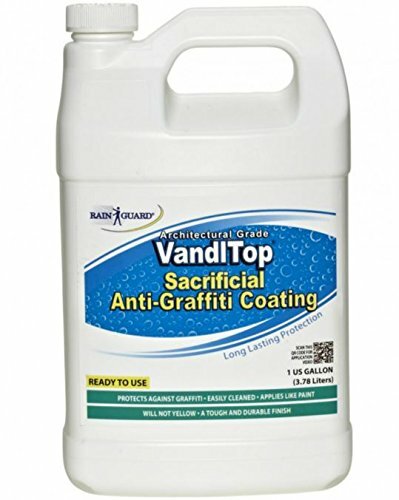 During the graffiti removal process, VandlTop, can be used as a sacrificial product. It must also be removed and has to be re-applied to maintain protection against future graffiti attacks. VandlTop can be used to protect more surfaces; concrete, stucco, EIFS, brick, wood, metal, plastic and even painted ones. VandlTop with its matte finish and non-yellowing formula has little impact or change on the look of building surfaces. 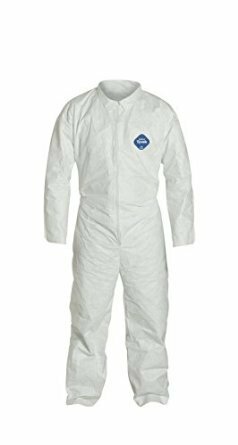 Coveralls made of heavy duty and impenetrable tyvek material features tear resistant zippered front. Provide the best balance of protection, durability and comfort. Protects clothes from spills and splatter. Available in white color. These heavy-weight, denim coveralls offer complete body protection, and feature front zipper and a pocket. Great for paint, construction and automotive industries. Come individually bagged and in assorted colors. 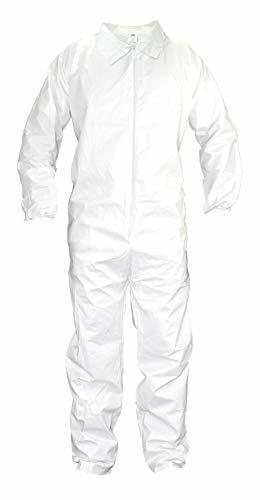 Tyvek coverall is composed of flash spun high density polyethylene which creates a unique, nonwoven material available only from DuPont. Tyvek provides an ideal balance of protection, durability and comfort of any limited use fabric technology. Tyvek fabric offers an inherent barrier to small size particles. Protection is built into the fabric itself; there are no films or laminates to abrade or wear away. Tyvek fabric's durability advantage over microporous film fabrics delivers consistently better barrier, even after wear and abrasion. Applications include: lead and asbestos abatement/remedation, general maintenance/operations, spray painting, general clean-up.